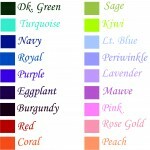 This page is intended to aid you in the process of ordering a personalized candle. 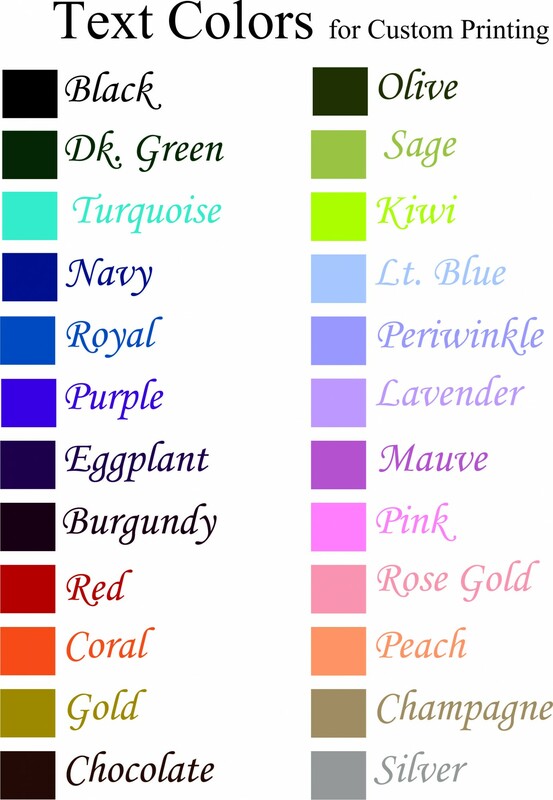 However, all personalized candles must be ordered over the phone (800) 238-8467. Prices and delivery times for personalized candles will differ from standard candles. Please allow 3-4 weeks for delivery of these custom made keepsakes. Personalized candles make wonderful keepsakes for special occasions. Our personalized candles are customer favorites, both for gift giving and for use in a wedding ceremony as a unity candle. They are equally suitable as anniversary gifts to congratulate a couple for an enduring and successful marriage. Our Wedding, Sweetheart, Sweetheart Flare, Lily and Round Floral Cross style candles are most suitable for celebrating a wedding or a wedding anniversary. But there are also many other occasions that our personalized candles are used to commemorate. Our candles can be used to help you celebrate births, baptisms, birthdays, graduations, or any event that deserves special recognition. A personalized memorial candle can be a comforting remembrance of loved ones who have passed on as well. Our candles can be personalized with Inlays or Plaques. Below, two examples of Inlay candles are shown. The personalized item is actually imbedded in the wax while the candle is being carved. Inlay candles are available in the large or medium sizes only. The shape of the inlay can be heart-shaped, oval, or adjusted to the contours of the item (such as a wedding invitation or photograph), which you provide. The size of the printed material on the inlay can be up to 4 ½ inches tall for the large size candle and 2 ½ inches tall for the medium candle, and a width of 2 ½ inches for either size candle. A custom printed inlay will add $15 to the cost of the candle ordered. 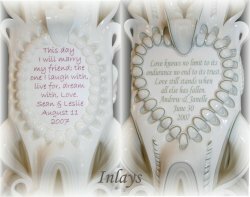 The candle designs available for the inlay candle are either the Wedding with swans, a cross and doves carved on the reverse side of the candle; or the Sweetheart design, with hearts carved on the reverse side. Both the Wedding and the Sweetheart candles have the full, curled, basketweave-like Holland House Candle cut at the base that we are so well known for. An example of a Plaque is shown below. The plaque is added to the candle after the candle has been carved. The plaque is attached to the candle with pearl-headed pins, is framed with a decorative braid, and a lovely bow is placed at the bottom of the plaque. A custom printed plaque will add $10 to the cost of the candle ordered. Plaques can be removed from candles if necessary. Plaque candles are available in all three candle sizes, large, medium or small. Plaques are always oval in shape. Because of the size restrictions of the plaque, they are most often custom printed by us. 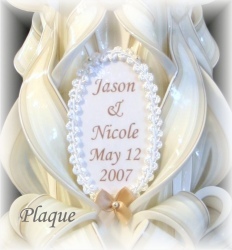 Plaques can be placed on Wedding, Sweetheart, Sweetheart Flare or Lily style candles. Please keep in mind, if you would like your own verse or poem added to a candle, that the more printing you have, the smaller the printing will be. 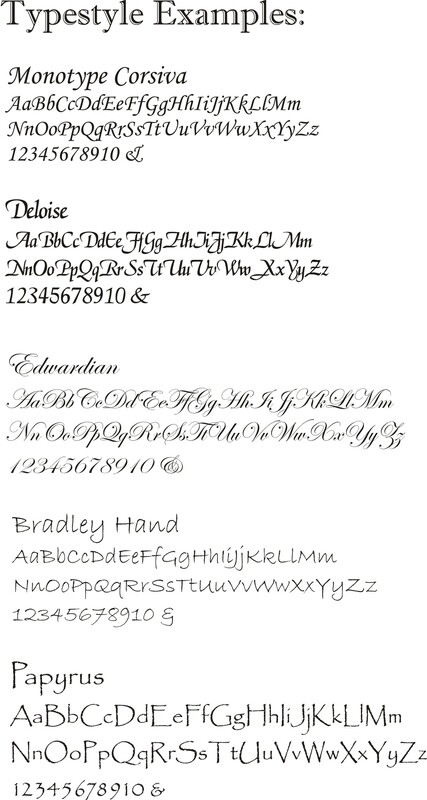 All verses can be followed by the couple’s name and wedding date, to further personalize the candle.